Gisquick is an open source geospatial data publishing platform. We have developed it for rapid sharing of our projects created with QGIS. We put together minimal set of functions for useful generic web mapping application. We created it for ourselves as well as for you. Let’s use it and share our great GIS outputs with others easily and much quicker. Gisquick is the set of mapping applications for publishing QGIS projects. It consists of QGIS plugin, Django based server application, QGIS-server, and web/mobile clients. The process of data publishing with Gisquick is quite easy. You can create and set up your projects with QGIS (layers, metadata, print layouts), prepare it for publishing using Gisquick plugin and upload it to the server. Use QGIS and Gisquick together and gain the ideal solution. Gisquick is developed as an open source project under GNU GPL license, and for client-server communication it uses only open protocols (WMS, WMTS and WFS). It can be used without any significant modifications, or used as a starting point for further development. Take full advantage of the Open source. All Gisquick server components can be easily deployed in Docker containers. You can start serving your GIS projects from the cloud (like Amazon Web Services) or from your own hardware. It is even simpler for project creators, all they need is QGIS desktop software with Gisquick plugin installed. Deploy Gisquick yourself or use our help. Gisquick web client gives you an easy to use user interface for viewing your GIS projects online (via Internet browser on any device). It is designed as responsive and mobile-friendly application, but a dedicated mobile client (Cordova hybrid app) for even better experience is also available. Use Gisquick to solve your tasks anywhere. Everything you need for creating maps in Gisquick is located at one place - on the side panel. It offers ready to use layer compilations (topics) suitable for basic users and well arranged layers (base and overlay layers linking up with attribute data tables and layer metadata) for users who are used to working with common GIS. Use Gisquick for more effective work with your end users. Working with data tables is very intuitive and quick. Gisquick combines map and table view on your datasets. You can enjoy map features (panning, zooming, navigating or geolocating) and features of database table (searching, filtering across big data tables or zooming and highlighting objects from table on the map) together in one application and at the same time. Use this opportunity for better comfort at work with GIS. Gisquick web client uses innovative print tool with advanced layout preview. Map will be automatically scaled to display whole page in selected zoom level, regardless of screen resolution. You can create custom print templates in QGIS desktop and use them in Gisquick web application. Try Gisquick print tool in our sample projects. Gisquick server supports server-side map tiles caching without any additional configuration. You can simply enable it for your projects with less often changing geometry data and achieve better performance and faster access to your maps. Improve server performance without an effort. Gisquick offers ready to use Topics (specialized layer compilations), which are suitable for basic users without any experiences with GIS. Topics are accessed from the Main panel. 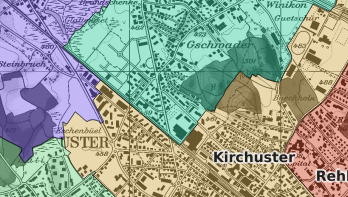 Gisquick also offers well arranged layers (base and overlay layers linking up with attribute data tables and layer metadata) for users who are used to working with common GIS. Attribute table tool allows to display data attributes of any layer with enabled WFS service. You can also display and zoom-to geometry of selected object in the table. Attribute table allows to filter displayed objects by visible screen area, or by logical conditions, which can be specified for any column in the table. Print preview shows you a page layout with appearance very close to the final print output. Map will be printed at the same position, angle and zoom level that you set. Print tool with opened panel. It allows you to configure print output (format, resolution), select page layout, or enter text labels (if defined in selected layout). When you want to view attribute values for a feature, use the identify tool that can be accessed from the Tools menu. Measure tool allows you to measure point coordinates, distances and areas. Measure panel has also options to select measure units, zoom to measured object, and it may contain some secondary measurements (not displayed on the map). Application running on mobile device with Android OS. It offers the same features as web application on regular desktop, but it uses more compact layout and has additional account settings and projects manager. More relevant information about Gisquick’s development, including source code, deployment and support for users is published on GitHub.This ambitious open source GIS project has been prepared for further custom development, maybe just according to your requirements. If you are interested in collaboration on this project, please contact us and become our partner. Let’s create Gisquick together.